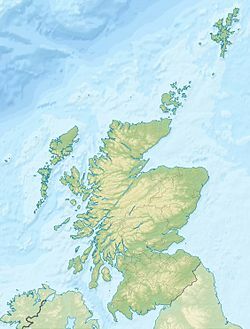 Geologically, the Firth of Forth is a fjord, formed by the Forth Glacier in the last glacial period. 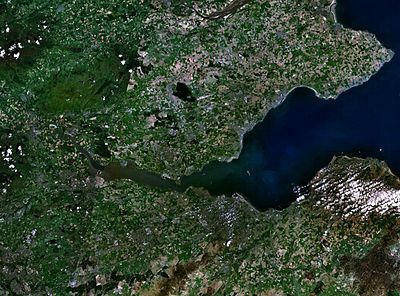 The drainage basin for the Firth of Forth covers a wide geographic area including places as far from the shore as Ben Lomond, Cumbernauld, Harthill, Penicuik and the edges of Gleneagles Golf Course. Many towns line the shores, as well as the petrochemical complexes at Grangemouth, commercial docks at Leith, former oil rig construction yards at Methil, the ship-breaking facility at Inverkeithing and the naval dockyard at Rosyth, along with numerous other industrial areas, including the Forth Bridgehead area, encompassing Rosyth, Inverkeithing and the southern edge of Dunfermline, Burntisland, Kirkcaldy, Bo'ness and Leven. The firth is bridged in two places. The Kincardine Bridge and the Clackmannanshire Bridge cross it at Kincardine, while the Forth Bridge, the Forth Road Bridge and the Queensferry Crossing cross from North Queensferry to South Queensferry, further east. The Romans reportedly made a bridge of around 900 boats, probably at South Queensferry. From 1964 to 1982, a tunnel existed under the Firth of Forth, dug by coal miners to link the Kinneil colliery on the south side of the Forth with the Valleyfield colliery on the north side. This is shown in the 1968 educational film "Forth - Powerhouse for Industry". The shafts leading into the tunnel were filled and capped with concrete when the tunnel was closed, and it is believed to have filled with water or collapsed in places. In July, 2007, a hovercraft passenger service completed a two-week trial between Portobello, Edinburgh and Kirkcaldy, Fife. The trial of the service (marketed as "Forthfast") was hailed as a major operational success, with an average passenger load of 85 percent. It was estimated the service would decrease congestion for commuters on the Forth road and rail bridges by carrying about 870,000 passengers each year. Despite the initial success, the project was cancelled in December, 2011. The inner firth, located between the Kincardine and Forth bridges, has lost about half of its former intertidal area as a result of land reclamation, partly for agriculture, but mainly for industry and the large ash lagoons built to deposit spoil from the coal-fired Longannet Power Station near Kincardine. Historic villages line the Fife shoreline; Limekilns, Charlestown and Culross, established in the 6th century, where Saint Kentigern was born. The firth is important for nature conservation and is a Site of Special Scientific Interest. The Firth of Forth Islands SPA (Special Protection Area) is home to more than 90,000 breeding seabirds every year. There is a bird observatory on the Isle of May. The youngest person to swim across the Firth of Forth was 13-year-old Joseph Feeney, who accomplished the feat in 1933. In 2008, a controversial bid to allow oil transfer between ships in the firth was refused by Forth Ports. SPT Marine Services had asked permission to transfer 7.8 million tonnes of crude oil per year between tankers, but the proposals were met with determined opposition from conservation groups. ^ "Firth of Forth". Ramsar Sites Information Service. Retrieved 25 April 2018. ^ "Forth area management plan 2010 – 2015" (PDF). SEPA. Retrieved 9 April 2017. ^ Anderson, Joseph; Jón A. Hjaltalín (Jón Andrésson Hjaltalín), 1840-1908; Goudie, Gilbert (3 January 1873). "The Orkneyinga saga". Edinburgh, Edmonston and Douglas. Retrieved 3 January 2018 – via Internet Archive. ^ Fraser, James E. (2009). From Caledonia to Pictland: Scotland to 795. Edinburgh: Edinburgh University Press. p. 171. ^ "No. 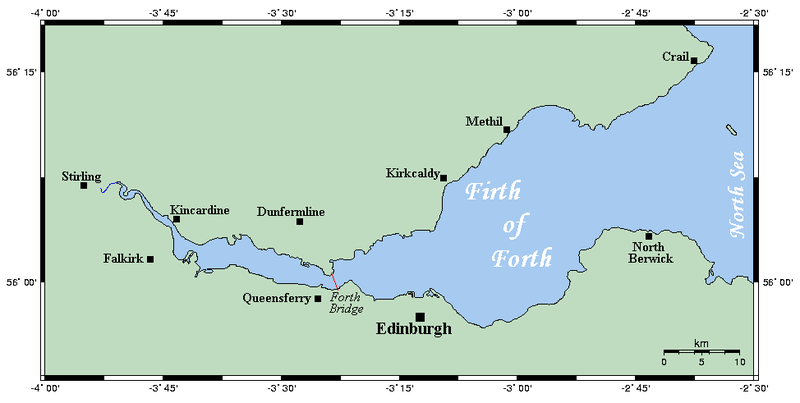 87 - The Firth of Forth" (PDF). Scottish Natural Heritage. Retrieved 8 April 2017. ^ Harrison, Jody (26 March 2018). "Secrets of the Romans' forgotten war against Scotland revealed". The Herald. Retrieved 22 May 2018. ^ Cooper, Henry (director). "Forth - Powerhouse for Industry". Moving Image Archive. Campbell Harper Films Ltd. Retrieved 15 May 2017. ^ Fraser MacDonald, "Scotland's secret tunnel under the Forth", The Guardian, 30 April 2014. ^ "Kirkcaldy-Edinburgh hovercraft trial". The Scottish Executive. 13 July 2007. Retrieved 10 January 2010. ^ "Plans lodged for Forth hovercraft". Edinburgh Evening News. 7 January 2010. Retrieved 10 January 2010. ^ "Forth oil transfer plan ruled out". BBC News Online. 1 February 2008. Retrieved 1 February 2008. Wikisource has the text of the 1911 Encyclopædia Britannica article Forth.